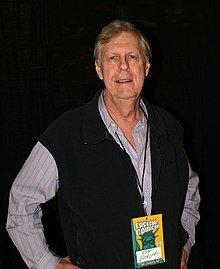 Rich Buckler (February 6, 1949 – May 19, 2017) was an American comics artist and penciller, best known for his work on Marvel Comics' Fantastic Four in the mid-1970s and for creating the character Deathlok in Astonishing Tales #25. Buckler drew virtually every major character at Marvel and DC, often as a cover artist. As a teenager in Detroit, Buckler attended the initial iterations of the Detroit Triple Fan Fair, eventually running the convention along with originator Robert Brosch in 1969–1970. Buckler's first comics work was as a teenager with the four-page historical story "Freedom Fighters: Washington Attacks Trenton" in the King Features comic book Flash Gordon #10 (cover-dated Nov. 1967). At DC Comics, he drew the "Rose and the Thorn" backup stories in Superman's Girl Friend, Lois Lane #117–121 (Dec. 1971–April 1972). Buckler drew the first three issues of writer Don McGregor's Black Panther series in Jungle Action vol. 2, #6–8 (Sept. 1973–Jan. 1974), a run that Comics Bulletin in 2010 ranked third on its list of the "Top 10 1970s Marvels". He fulfilled a decade-long dream in 1974 when assigned to draw Marvel's flagship series, Fantastic Four, on which he stayed for two years. During this period, Buckler created the cyborg antihero Deathlok, who starred in an ongoing feature debuting in Astonishing Tales #25 (Aug. 1974). Also during this period, Buckler hired the young George Pérez as his studio assistant. Buckler collaborated with writer Gerry Conway on a "Superman vs. Shazam!" story published in All-New Collectors' Edition #C-58 (April 1978). He drew the newspaper comic strip The Incredible Hulk for approximately six months in 1979. A Justice League story by Conway and Buckler originally intended for All-New Collectors' Edition saw print in Justice League of America #210–212 (Jan.–March 1983). Buckler and Roy Thomas then created the World War II superhero team the All-Star Squadron in a special insert in Justice League of America #193 (Aug. 1981) which led to the team's own title the following month. In 1983,The Comics Journal accused Buckler of plagiarism, saying that he had a reputation as a "swipe" artist who copied poses and layouts from previous artists' work. Buckler sued the magazine for libel, but later dropped the suit. Buckler worked for Archie Comics in 1983 and 1984, when that publisher briefly revived its Red Circle Comics superhero line, and he recruited Cary Burkett to write the Mighty Crusaders title. In 1985, Buckler returned to Marvel and briefly drew The Spectacular Spider-Man with writer Peter David, where they produced the storyline "The Death of Jean DeWolff". He also served as editor for a short-lived line of comics by Solson Publications, where in 1987 he created Reagan's Raiders. He was the author of two books: How to Become a Comic Book Artist and How to Draw Superheroes . In 2015, he became an Inkwell Awards Ambassador. Buckler died May 19, 2017 after a long battle with cancer. ^ a b "Rich Buckler, Prolific Marvel and DC Comics Artist, Dies at 68". The Hollywood Reporter. May 20, 2017. Archived from the original on May 21, 2017. ^ Bails, Jerry; Ware, Hames (n.d.). "Buckler, Rich F." Who's Who of American Comic Books, 1928–1999. Archived from the original on February 18, 2016. ^ Cassell, Dewey (May 2013). "A Rose By Any Other Name...Would Be Thorn". Back Issue!. Raleigh, North Carolina: TwoMorrows Publishing (64): 28–32. ^ Thomas, Roy. "Bullpen Bulletins," Marvel comics cover-dated January 1974. ^ O'Neill, Daniel Patrick (July 1994). "Career Moves". Wizard (35). Archived from the original on September 7, 2009. ^ Cassell, Dewey (February 2014). "Smashing into Syndication: The Incredible Hulk Newspaper Strip". Back Issue!. Raleigh, North Carolina: TwoMorrows Publishing (70): 37–40. ^ "Plagiarism: Rich Buckler Signs his Name to Jack Kirby's Work". The Comics Journal (83). August 1983. pp. 33–35. ^ "Rich Buckler Answers His Critics". The Comics Journal (86). November 1983. pp. 28–31. ^ "Rich Buckler Sues Comics Journal and two of its Writers for Libel". The Comics Journal (88). January 1984. p. 13. ^ "Buckler Drops Comics Journal Libel Suit". The Comics Journal (93). September 1984. pp. 11–12. ^ Reagan's Raiders at Don Markstein's Toonopedia. Archived from the original on December 21, 2016. ^ Buckler, Rich (1986). How to Become a Comic Book Artist. Solson. ISBN 0-9615671-1-2. ^ Buckler, Rich (1987). How to Draw Super-Heroes. Solson. ISBN 0-9615671-5-5. ^ "Ambassadors". Inkwell Awards. Archived from the original on January 28, 2016. Retrieved January 27, 2017. ^ Almond, Bob (January 11, 2016). "Rich Buckler Made Inkwell Awards Ambassador, Plus Roster Changes" (Press release). First Comics. Archived from the original on March 19, 2016. Wikimedia Commons has media related to Rich Buckler. Official website and archive of Buckler Comic Art official site. Archived on December 19, 2013.